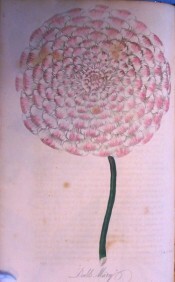 ‘This beautiful variety was raised by Mr. Dodds, gardener to Sir George Warrender, and is generally considered by all who have seen flowers of it, to be unrivalled in its class; wherever we have seen it exhibited, either in the country or metropolitan shows, its superbity was so evident, that the most inexperienced in a knowledge of the properties of a first rate flower were struck with its beauty, which those persons capable of ascertaining its merits, without a single exception that we have seen or heard of, state that it is, in its class, superior to any other exhibited this year.’ [FC p.264/1836]. [FC p.122/1836]. The flower is fully double, almost globular, white, with a very pale pink blotch at the edge of the petals and would be classified as a Show Dahlia today. The Gardeners Chronicle listed ‘Mary’ among the best 50 dahlias available. The grower was recorded as Dods, although the spelling Dodds, which appears to be the correct one, also occurs elsewhere in this periodical. [Gard. Chron. 1841]. Dodds’ ‘Mary’ won 92 prizes in the Dahlia shows of 1840, confirming its superiority. [FC p.13/1841]. 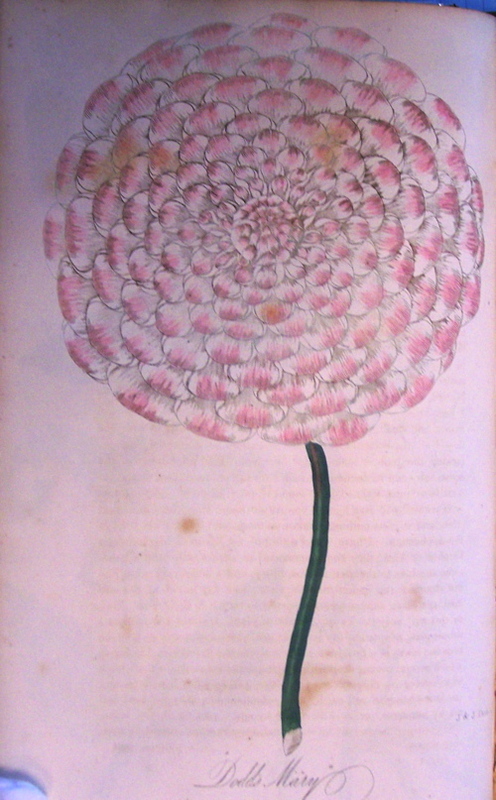 For more information on botanical and horticultural history of the Florist’s Dahlia see Dahlia pinnata Cav. Listed in all published catalogues [B.106/1843].